It's been some time since I've posted, as I've had several other research and/or restoration projects that moved to the forefront, which, in turn, put the wreckchasing and crash site research on the back burner. But, sometimes, a project pops up that is so tempting, I can't pass it up. 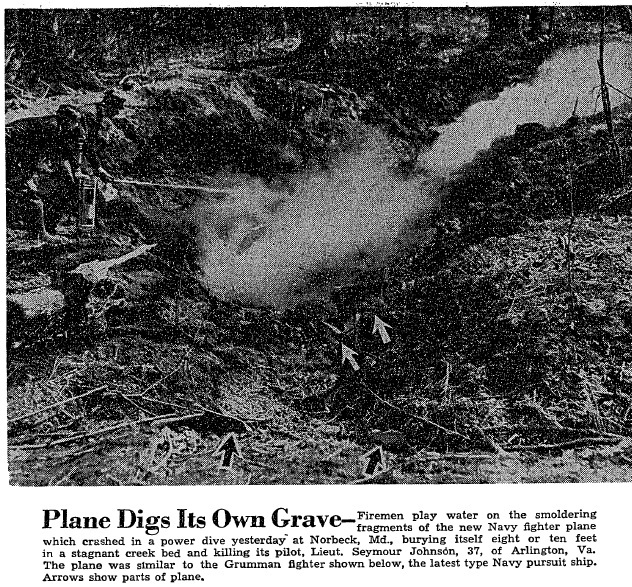 While researching another topic, I tripped across an article regarding the crash of an F4F-3 in Norbeck, Maryland, which is considered Rockville these days. The plane was on a test flight from NAS Patuxent and was up at 30,000 feet when there was some kind of oxygen failure. The plane simply nose dived into the ground, somewhere near where Manor Country Club is today. This is about a five minute drive from my office. The pilot was Seymour Johnson. He was a North Carolina native and Seymour Johnson AFB was named in his honor, even though he was a Navy pilot. There's a pretty good chance the terrain where the plane went in is still undisturbed. We'll see what we can uncover. Stay tuned. It looks like the site may yet be another park under the jurisdiction of the M-NCPPC, the same folks who own the land at the Clarksburg and Beallsville sites. The terrain sure does look very close. I received the Navy accident report. There's nothing in the report that would assist with locating the spot. I've received some anecdotal testimony that when they were building Leisure World (originally called Rossmoor) that aircraft parts were found when clearing the land in 1967. The only location that is fairly well known is of Manor Country Club, which still sits on the same tract of land that it did in 1941. We do know that it was not close to the road -- today's MD 97, Georgia Avenue, as the testimony indicates that firefighters had to go through the woods to get to the crash site. The local park that I mentioned above is still a very good candidate, other than it's location seems to run counter to the anecdotal testimony. Don't forget to try to obtain death certificates, police reports, and coroner reports if available. Death Certificates have helped me at least twice now, and were far more accurate than the newspaper reporting or military crash report. I did some digging and found that his death certificate has his rank included in his first name, which probably doesn't help researchers. I tried other sites to see if you could get it online, but couldn't locate it. That is the direct link to the order form for his death certificate, not sure if the $25 is the cost or it's cheaper for a non-certified copy.